Two men, on the outside they don’t seem to be different; however, on the inside one has a heart after God, the other’ heart is focused on himself and covered in pride. Both of these men have sin in their lives, both of these men have “missed” it; yet one repents and turns back to God the other doesn’t. One is at war with God the other is at peace. If one were to look at the entire life of both of these men, I think Saul would come up smelling like a rose, while David would be severely condemned. However, the difference can be found in the heart. David wanted to please God Saul wanted to fight Him. Saul fought to keep his name in the limelight by any means necessary; David lifted up God’s name. Death, necromancers (the witch at Endor), familiar spirits and mediums. I think everyone needs to take a deep breath and go back and read Jesus’ reply to the Sadducees (Sad-to-sees) who gave Jesus that crazy scenario about the woman who married and outlived seven brothers (Matthew 22:23-29; Mark 12:18-27; Luke 20:27-40). The bottom line is this, those that die a physical death, in Christ even before Christ physically came upon the earth (Samuel et all) are not dead in God’s sight. As far as man is concerned now, Abraham, Isaac and Jacob are long dead but Jesus reminds us that God spoke of them as being in the hear and now. God said I am the God of … Not I was the God …. We, I believe, in my humble opinion have the wrong understanding of what death is. Cessation of life is not death; being removed from the presence of God is death. We are made in the image of God and God is Spirit not flesh. Who we are, is not who and what we are in “flesh” but in spirit. Our spirits our born again, not our flesh. Our flesh will be redeemed and put back together again in a form that will be incorruptible, like Jesus’, when Jesus comes again. 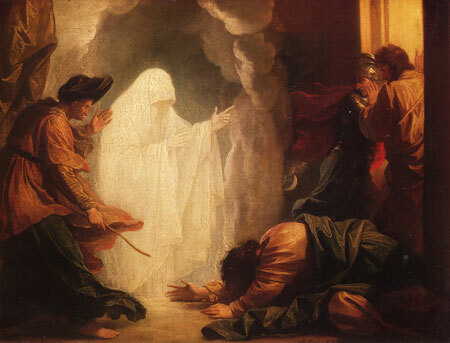 The witch/medium of Endor had no plans or inclination of bring up Samuel that is why she screamed. She wasn’t expecting the real Samuel. Remember Jesus’ story of Lazarus and the rich man? (Luke 16:19-31). Each of them recognized each other, Abraham, Lazarus and the rich man AFTER DEATH but they were not dead; however, the Rich Man had a location problem, he was in the wrong location removed from the Presence of God. .
Also something to think about, if death, physical death is so atrocious for the believer, why would Samuel be upset to be called back into the land of the physical living. He said that they had disturbed him. This is not what I had initially decided to focus on, but reading the posts led me down this path. P.S. Someone, I’m sorry I can’t remember who, asked about Jesus being the first raised from the dead when others, like Lazarus in the John reading had been brought back to life. Well again, we need to be clear on what “death” Jesus is talking about. Yes, Jesus brought back people from the dead, and by the way so did the prophets Elijah and Elisha; however, all those folks died a physical death, again. Jesus was the only one who came back to physical life but will NEVER die a physical death again. Those who are His will also be clothed with a body that will be eternal and incorruptible when He returns. Oops! I forgot about the witches; familiar spirits and mediums. Each of these things deal with death, something that well, scares us to death. We don’t know what is on the other side; however, God has told us what He has prepared for us but He left no solid proof. That is why we operate by faith. Witches, familiar spirits and mediums allege to tell us what God won’t. This is the same thing that happened in the Garden, “Did God say …?” We are enticed into this realm of demonic activity because deep down inside we believe God is keeping us in the dark, He’s pulling a fast one. It’s not demonic because it’s spooky and eerie; it is demonic because it is in the realm of Satan. I think I stated this before, There are only two Kingdoms; The Kingdom of God or the Kingdom of Satan. Everything in the Kingdom of Satan is demonic. In the Kingdom of God, Jesus is Lord; In the kingdom of Satan, Satan isn’t Lord—self is Lord. Here is something to think about, what is a medium. It is someone who alleges to stand between the living and the dead. The problem is that anyone who operates in these modes are DEAD, spiritually dead. If Believers, God’s folk—His people, go to one of these to find out “stuff,” they are talking to dead folk (spiritually dead) about well dead folk (physically dead and possibly spiritually dead also). There is someone who stands between the living and the dead and it ain’t no medium it is Jesus Christ. Familiar spirits are those demonic spirits that have hung around your family, region, country through the ages and know everything about you. That’s why they are familiar and you are comfortable with them being around. If someone or something gives you a “word” you best know how that “word” lines up with the Word. We are suppose to walk by faith not by our senses, feelings and emotions. Witches are just necromancers; folks hanging around dead stuff and dead folk. Why if Jesus is the Truth and the Life, why would we want to rub shoulders and elbows with death when we have Life? What we are really concerned about our loved ones who we may or may not see in heaven, bottom line. But guess what, when you get to heaven, if those folks are saved you will see them; if not, you won’t remember. There will be no tears shed in heaven.